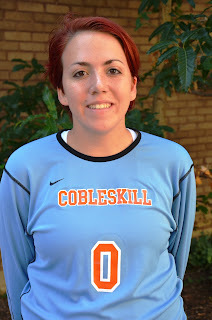 The SUNY Cobleskill Department of Sport & Exercise announced today that freshman Samantha Springstead, Staten Island, N.Y., Notre Dame Academy, women’s soccer team has been named the athletic program’s Fighting Tiger Athlete-of-the-Week for the week ending Sunday October 30th. The freshman goalkeeper recorded 16 saves in a season closing 2-0 victory over North Eastern Athletic Conference (NEAC) rival Wilson College in a game played on the turf at Keystone College in La Plume, Pa. on Sunday afternoon. With the win the Fighting Tigers close the season with a 7-11 overall record including a 3-10 mark in conference play. During her rookie season with Cobleskill Springstead appeared in all eighteen contest posting a 7-11 overall record including six wins by shutout. The Notre Dame Academy alumnus allowed 3.46 goals per contest this season making 201 saves with a save percentage of .781 on the year.